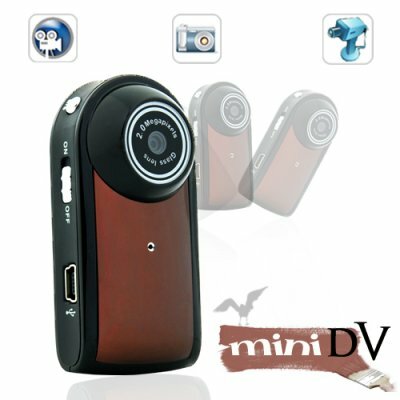 Successfully Added Ultra Compact MiniDV Camcorder (Motion Detection, 30 FPS) to your Shopping Cart. The DV26 sets a new record for high quality ultra compact camcorders. This is because within its attractive enclosure is a powerful 2 megapixel CMOS sensor that records video at an impressive 30FPS and 640x480 resolution. This translates into stunningly beautiful video previously unimaginable with camcorders this small. How small do you ask? So small that you can easily conceal it within the palm of your hand, so small that you can put it on a key-chain and hardly even notice its there. With the DV26 you can take high resolution digital videos everywhere you go and never have to worry about carrying around heavy camera equipment again. Covert Surveillance Camera - With its motion detection ability you can set it up to record only when motion is detected. This is the perfect way to catch a burglar in the act or see if your wife is cheating on you when you are away from home. With all the uses this convenient camcorder has to offer there is no excuse to not have one with you at all times. From the high resolution 2 mega pixel sensor and motion detection photo and video function to its ultra compact design and attractive styling, the DV26 is sure to become one of the top selling items in 2010. Place your single piece or bulk orders now while this amazing product is in stock and ready for immediate shipping. Recording can be motion or manually activated. Fast delivery, the product is amazing for its size, the quality is great!! It was delivered fast..and works perfect..very small...good quality video. Excellent for security recording. On my first trial of this camera in an local shopping centre (where cameras are not allowed), I was shopping with my mother and we met a woman who came from her home town in Scotland. She was talking to my mother about the town but my father was not there to join in. Thanks to the camera, he saw and heard the whole encounter when we got home. And the woman had no idea she was even being filmed.